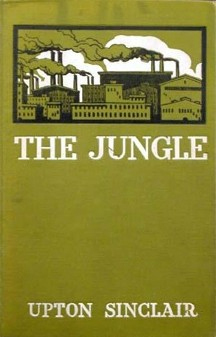 Originally written to illustrate the life of a Lithuanian immigrant, Upton Sinclair’s The Jungle became more well-known for its depiction of the unsanitary and unsafe practices of the meatpacking industry. Descriptions of horrors such as workers falling into the grinding machines and being sold as lard resulted in public outcry for government intervention and regulation of food production. This work became associated with other works aimed to expose corruption or exploitation to the public and Sinclair became known as a “yellow journalist” or, as Theodore Roosevelt coined, a “muckraker”. As a direct consequence of public pressure resulting from The Jungle, the United States government became involved in the regulation of the food industry and still is today.